Canon PowerShot G7 X review: Has it got that X-tra something? The Powershot G7 X is the first compact from Canon to feature a 1-inch type 20.2-MPix BSI CMOS to compete with the Sony Cyber-shot RX100. It’s paired with the firm’s Digic 6 processor for sensitivities up ISO 12,800, continuous shooting in RAW at up to 6.5fps and a raft of video capabilities including full HD (1080p) at 30 fps and 60fps slow-motion. At the rear there’s a 3-inch tilting touchscreen LCD, although unlike the later Sony Cybershot RX100 II and III series models it only tilts upwards (and not downwards as well for overhead shots). Apart from the sensor, perhaps the most intriguing feature of this camera is the high-speed 24-100mm equivalent f1.8-2.8 stabilized zoom – neither the RX100 II with its 28-100mm f1.8-4.9 zoom which is slower at the longer-end, or the RX100 III can match that with its shorter 24-70mm f1.8-2.8 lens, though both models are stabilized. The Powershot G7 X measures 4.1 x 2.4 x 1.6″ (104.1 x 61.0 x 40.6mm) and weighs just 10.70 oz (303.3g) with battery and SD card, and is available to pre-order for $699. 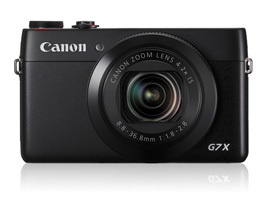 For more information about specification, Canon Powershot G7X preview is available here. 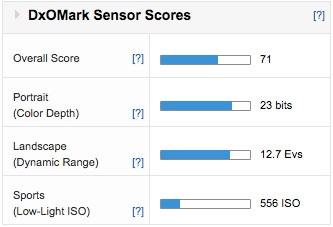 With a DxOMark Sensor score 71 the G7 X ranks highly in our database rivaling classics such as the original full-frame Canon EOS 5D, the APS-C Nikon D300s and more modern designs such as the micro four thirds Panasonic Lumix DMC-GX7 and GM1 and outperforming the Nikon 1 series models with the same size sensor, such as the S1 at 56 points. The 1-inch type sensor has high color depth at 23 bits and a wide dynamic range of 12.7 Evs. 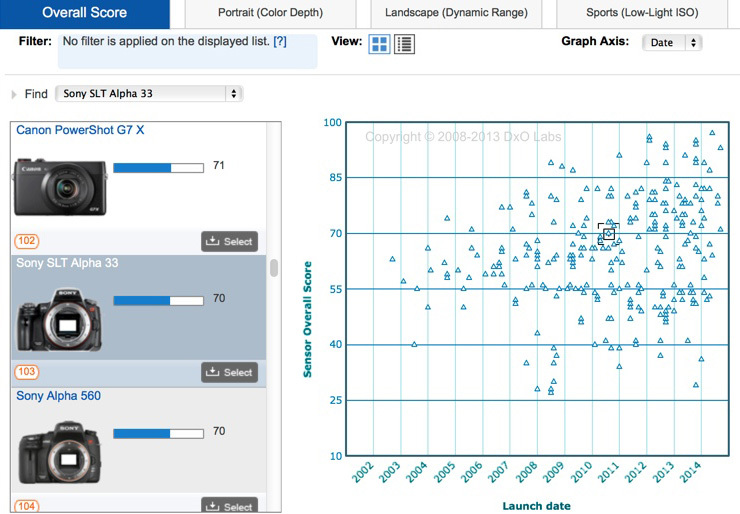 In good lighting, these scores put the K-500 almost on a par with the best full-frame models. 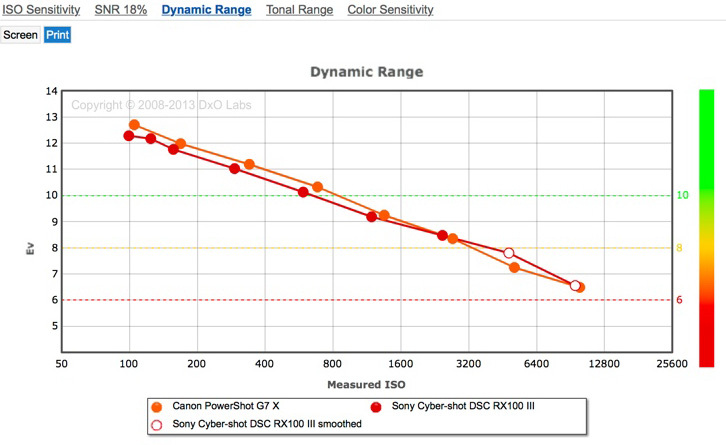 In our low-light tests, the G7 X also performs well for this size sensor. The third-generation RX100 III has an almost identical performance as the RX100 II. 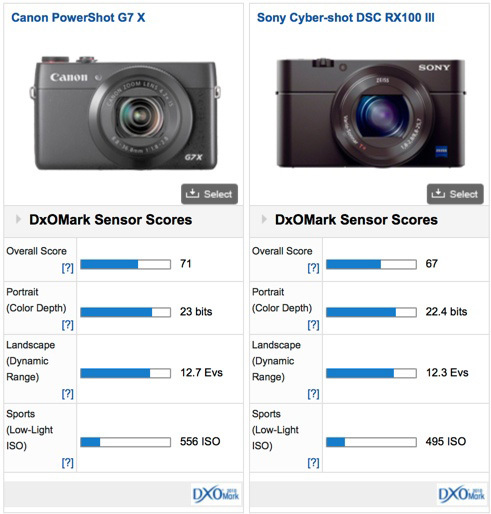 The differences in Color Depth, DR and ISO are negligible (which accounts for the same overall DxO Mark score) and so it’s safe to assume the two Sony models adopt the same sensor. As the RX100 III is the latest model from the firm, the result tends to support the notion that the sensor is the same, only Canon scores a very slightly better dynamic range. The G7 X has a high-speed lens with the widest range that sets it apart from the RX100 series. If the 24-70mm lens on the RX100 III is enough though the Sony is the better specified of the two, but then that’s reflected in the steeper price. Although it was Nikon who was first to adopt and popularize the 1-inch sensor format, it was Sony who dominated this format with the RX100 series. Now with Panasonic and Canon adopting the sensor the field is opening up.